A computer model crunching a person’s Facebook “likes” can do a better job judging their personality traits than their own friends and family, according to a recent study conducted by researchers at the University of Cambridge and Stanford University. 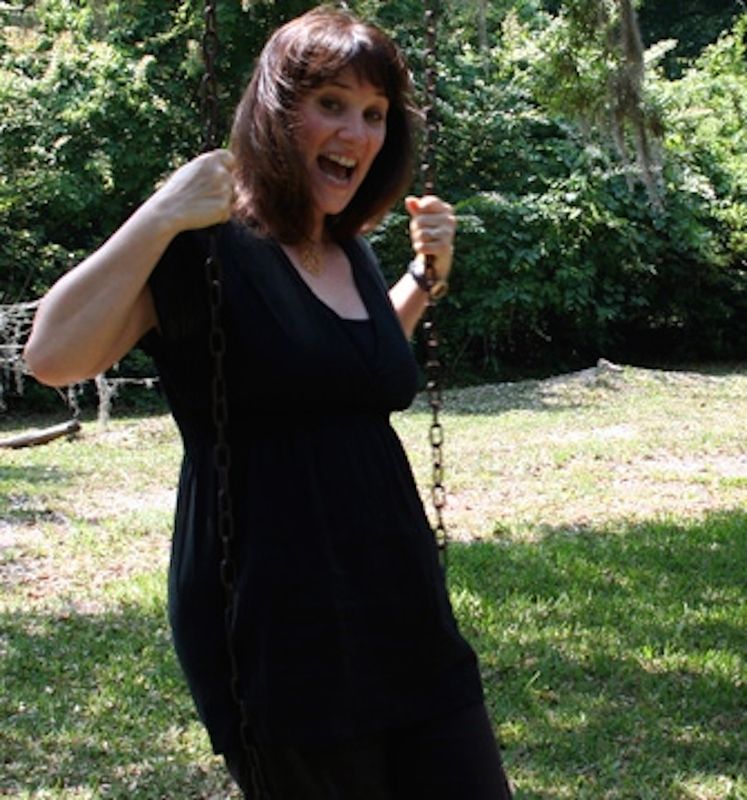 That “was nice for us to hear because it validates what we’ve been thinking for a while, but on the other hand, it’s probably scary,” said Diane Szoke, founder of Relocality. Szoke is helping pioneer a new frontier in neighborhood and online real estate search: search tools that guide you to neighborhoods and listings based on your social media content. If a computer model can predict your personality, the thinking goes, shouldn’t it also be able to predict where you would like to live? 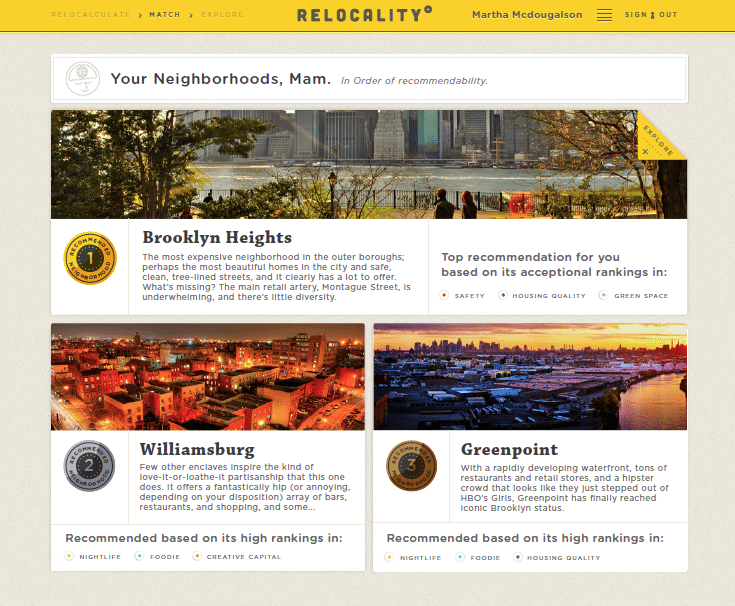 Screenshot showing neighborhood recommendations page that will be part of Relocality’s new user interface, set to launch in late March. Relocality analyzes your Facebook content, including your demographic information, Facebook “likes” and content that appears on your wall, and then surfaces three neighborhoods based on its analysis. “So if you are an astrophysicist who bicycles daily, likes to kayak in the summertime and brunch on the weekends, you might belong on the Upper West Side with access to the bike path, the river, sporting goods stores, brunch spots and a world-class planetarium,” Szoke said, offering an example of the interests Relocality can glean from a person’s Facebook account to make recommendations. Relocality covers only New York City, but it recently gained the backing of a Dutch investor and is in the process of expanding into Amsterdam. Hubdin, a mobile listing search app and website, is another app that’s trailblazing social real estate search. The startup’s listing search tool guesses your search preferences based on your Facebook content, and then scores neighborhoods based on them. 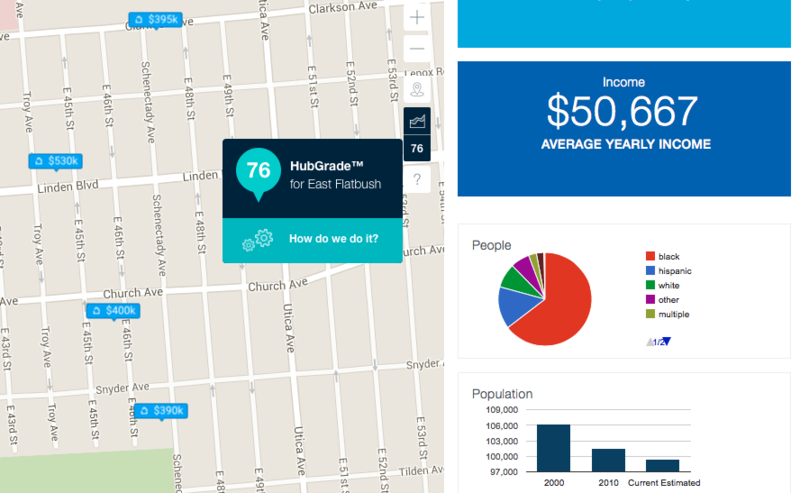 Unlike Relocality, Hubdin is designed to help people hone in on listings, not just neighborhoods. Users looking at listings on a map can see the score of a neighborhood as they center the map on different areas. “Let’s say on your Facebook page you like Tiger Wood’s fan page … we may rate something a little higher because it has close proximity to a golf course,” said Adrian Esquivel, founder of Hubdin. Screenshot of Hubdin map-based listing search results page. It’s easy to imagine such algorithms missing the mark, perhaps overweighting something you don’t actually appreciate, but still “liked” on Facebook a long time ago. Hubdin is exploring how to represent the conclusions it draws about users’ preferences, so that they can adjust them to generate more accurate neighborhood ratings. The natural next step for a search service like Hubdin is to score actual properties. Esquivel says he sees online real estate moving in that direction, but notes that rating properties based on a person’s preferences is more challenging and probably should involve gathering some user input upfront. Another real estate startup, Revaluate, has already begun to assign “livability” scores to properties in Manhattan based a wide array of factors. 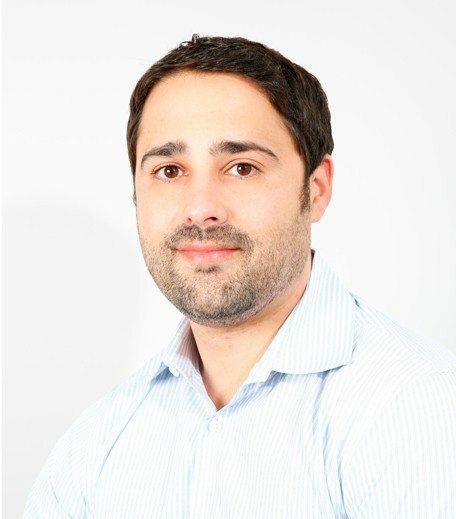 The scores aren’t tailored to a person’s preferences, but co-founder Max Galka said Revaluate might choose to personalize them in the future (though he said the startup would be more likely to base personalized scores on a user’s input, not their social media profile). Relocality users will soon gain the ability to invite friends to collaborate with them on their search for the right neighborhood, when the site relaunches in late March. Friends will be able upvote and downvote neighborhoods, recommend new neighborhoods, and mix images and video into a user’s neighborhood dossier. Szoke envisions real estate agents joining in on the fun, contributing images of community highlights or listings into a client’s Relocality neighborhood dossier. 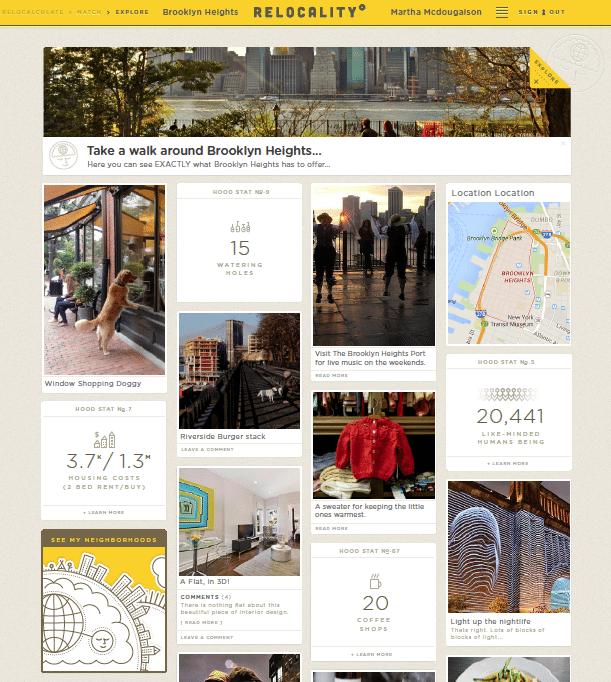 Screenshot showing Relocality neighborhood page design that will be part of the website’s new user interface. She can also see Relocality partnering with a listing portal in the future to make it easy for users to fuse the online home search with the neighborhood search. These services are just finding their legs. Odds are it’s just a matter of time until real estate search websites begin to shepherd people towards neighborhoods and listings, rather than merely returning results based on inputs. That may speed up the home search process for some consumers, but it could also cause some headaches for real estate agents. While social search services could help clients lock in on what they want, they would compete with agents as neighborhood matchmakers. And automated home valuations have made it clear that algorithms and real estate agents don’t always agree. Clients might also be more prone to question an agent’s advice if their friends can easily monitor and weigh in on their home search. Depending on the assumptions built into their algorithms, search services that steer people towards certain neighborhoods and listings could also potentially discourage demographic integration. If an algorithm takes it for granted that people prefer to live near people who are like them, that would reinforce residential segregation — an issue Inman has explored. But that’s a dystopian theoretical. By marrying a person’s feedback with an analysis of their social media content, search algorithms will also shepherd open-minded people to diverse communities.